UPDATED: Sat., Feb. 9, 2019, 11:23 p.m.
PULLMAN – In his first 12 months as athletic director at Washington State, Pat Chun has turned over 25 percent of the staff, overseen a record year in fundraising and been the grateful witness to a charmed football season that set standards for everything from victories to GameDay gaga. What he hasn’t done: redecorate. Outside of some personal snapshots, his office in Bohler Gym looks much like the one Bill Moos inhabited – right down to the same dark wood bookcases and overstuffed chairs. “Bill has pretty good taste,” Chun allowed. But Moos, his critics suggested, had reached a cul-de-sac with his approach at Washington State. Football was on sound footing, but basketball was foundering. The facilities he’d built had left an Everest of debt. Personnel and culture issues were festering under the surface. The president was pushing for bigger fundraising results. And when an opportunity presented itself at the University of Nebraska, Moos seized it – leaving the furniture behind for Chun, fresh from running his own store for the first time at Florida Atlantic and with a background steeped in the success of his alma mater, Ohio State. Who couldn’t have had any notion of the year that awaited him – from the unspeakably tragic to the wildly triumphant, with nearly every imaginable detour in between. In the hour Chun was being introduced to his new constituents, volunteers were still taking away the last vestiges of the makeshift memorial that had gone up near Martin Stadium after the suicide of quarterback Tyler Hilinski the previous week. Even so, WSU’s response strained relations with the Hilinski family, who expected more in the way of a tangible tribute to their son at the Cougars’ 2018 home opener. Meanwhile, the department and school initiatives on the mental health front have been vigorous and exemplary. In the ensuing months, the challenges – and things to cheer – came as if out of a firehouse. Responding to legislative mandate, Chun had to formulate a plan to draw down his department’s monstrous cumulative debt – projected to reach $85 million by 2022. In September, former WSU quarterback, radio analyst and fund-raiser Jason Gesser resigned after charges of sexual misconduct, later reaffirmed by a university investigation. Men’s basketball fortunes – and attendance – sank to further lows, at least until the Cougars found new life in Arizona this weekend. And, of course, the Cougars were at the center of revelations that Pac-12 football administrator Woodie Dixon had improperly interfered in replay decisions made at conference headquarters, which may have played a factor in a late targeting episode in the USC game that went uncalled – and prompted a flurry of angry texts from Cougars coach Mike Leach. Chun said he’s “confident we’ve taken steps forward” on the Pac-12’s replay/administrative issues. Is his coach similarly confident? “You’ll have to ask him,” Chun laughed. But in the midst of all that, Wazzu’s remarkable football season – and the cult of personality that sprouted from arrival of transfer quarterback Gardner Minshew – generated an era of good feelings and national buzz the school couldn’t buy. And that culminated with the fan base’s holy grail: ESPN College GameDay’s truck rolled into Pullman for the first time – and the fire marshal pegged the crowd for the show at 30,000. But the real byproduct of the football season? And now the Cougars have to capitalize on it. The staff turnover (”some people left for different opportunities, some just didn’t fit in with what we’re trying to do,” he said) is part of a retooled fundraising strategy that, boiled down, amounts to using more shoe leather to “go see these people.” Because there’s debt to pay, yes – but the reason there’s that debt is because the Cougs didn’t build on their success of 20 years ago. “And building again is a lot harder than sustaining,” Chun said. 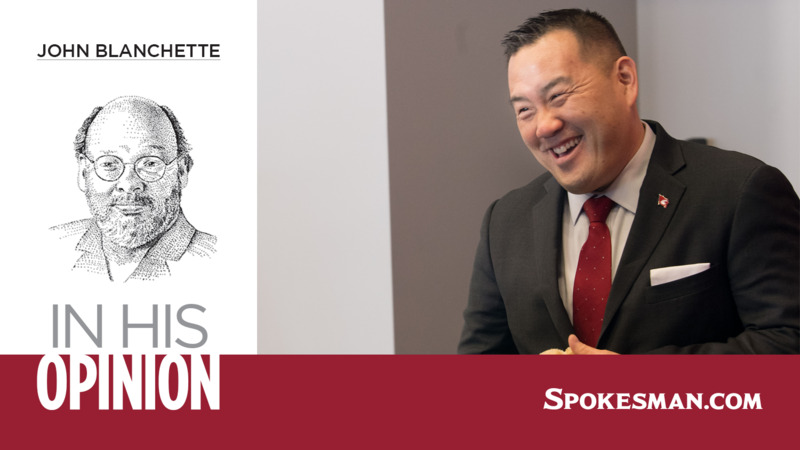 If a new guy’s bona fides are tied to a paycheck in the hiring honeymoon, there eventually has to be a sense that he’s become a Coug – particularly if he’s, as Chun called himself, an outsider. That might not be as difficult as it sounds. But accompanying the football team to the season opener at Wyoming was Chun’s turning point. Just more furniture that turned out to be already in place. Published: Feb. 9, 2019, 7:11 p.m. Updated: Feb. 9, 2019, 11:23 p.m.